The 7th Anniversary celebrations event, held on 26th April at Le Royal Meridian, Chennai, was thought-provoking treat to all the guests. The program, a panel discussion on 'The Power of Networking,' had as guest speakers, Ms. Usha Mohan Co-founder & Managing Director, Triumph India; Mr. Chandu Nair, Entrepreneur-Advisor and Ms. Sumathi Srinivas, Managing Director, Rays Publication Private Ltd. Ms Jennifer McIntyre, Consulate General for U.S., was the guest of honor. After the initial networking and high tea, the program commenced with the President’s address. Mrs. Kalyani, President of eWIT briefed the audience on the progress of eWIT, from its inception to its current programs. Outlining the goals of the forum, she made an appeal to all present to encourage individuals to become members of eWIT. Ms Sarada Ramani, General Secretary, spoke on the various events conducted by the forum during 2012-13. She informed the audience on the increased number of colleges as institutional members, the launch of eWIT’s Trivandrum Chapter. Then, Ms. Rama Sivaraman, Vice President of eWIT, introduced the Guest of honor, Ms. Jennifer McIntyre, and invited her to address the audience. Ms. McIntyre delivered and inspiring speech, touching on facets of networking. She spoke on the gender differences in networking and how networking for women need not be as it is for men. Talking about the specific benefits of networking, Ms McIntyre suggested a sure way would be to join organizations such as eWIT. She spoke about the symposium held by the US consul in Dec 2012, where women from different states of India interacted with women entrepreneurs of entire world. She concluded with her belief that personal networking and contact building makes women good leaders. Answering the question on how networking across cultures could be handled, Ms. McIntyre advised a thorough study to understand the cultures first and then planning activities in line with the culture would help overcome the cultural differences. To the question on how to overcome the fear of being wrong or branded, McIntyre suggested women adopt an honest, open and professional approach towards all types of challenges. Ms Usha Menon addressed the audiences with interesting insights on technical networking and social networking. She urged women to be thought leaders and develop their persona through the various networking avenues available today. She urged women to explore the different networking forum available and choose the one you would need the most. Being a passive participant in the discussions will get you nowhere. She requested women not to put networking last among their priorities and shares her reasons for saying so. 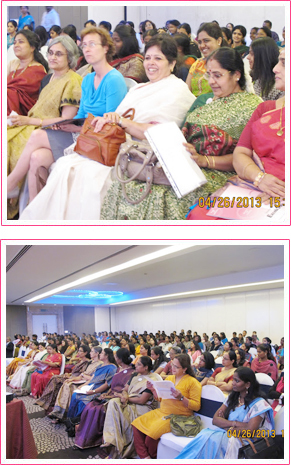 Mrs. Sumathi Srinivas offered some insights into qualities women need to have while networking. She stressed on behaving with patience, flexibility and professionalism. Men are considered better at networking because they take things lightly and do not get emotionally attached. There is no gender difference when it comes to networking as women are now coming out of the doors to join men who were always outside the doors. The Q&A session that followed was interactive with questions and suggestions. Mr. Mejo John, Facility Manager, Excelacom, the souvenir sponsor, released copies of 7th anniversary souvenir and Ms. Chitra Ravichandran, Director - iNautix Technologies, the Principal Sponsor received a copy from him. The eWIT Excellence Award 2012 prizes were distributed to the winners of the competition. Cognizant and Tech Mahindra were the sponsores of the awards. The evening ended with a vote of thanks by Ms. Lakshmi Gopal, Treasurer – eWIT. The event was covered by over a dozen newspapers and magazines.